If Katie Duke looks familiar, your memory serves you well—she played a prominent role in ABC’s highly acclaimed documentary series NY Med. It aired in the summer of 2012 and followed medical teams and patients at three New York City hospitals. The NY Med producing team—who also created Hopkins and Boston Med—are preparing for a second season of the show which will air this summer, and Duke will again be starring with Dr. Mehmet Oz. In the Spring 2014 issue of Scrubs, Editor Catherine Ettlinger interviewed cover model Duke about her career, patients and the nursing profession. Below are three Scrubsmag.com-exclusive messages Duke wants YOU (and the whole world) to know! 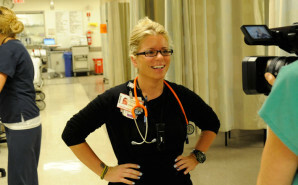 The media image of nurses needs a makeover. Knowledge is power… that goes for nurses, too.